Companies including FoxNext, Zero Latency, and Disney's ILMxLab with Star Wars are demonstrating that location-based virtual reality (LBVR) is a viable business for investment, which is enticing mainstream consumers to satisfy their VR curiosity. This is demonstrated by the high levels of growth, with consumer spend expected to reach $809 million by 2022, according to the latest VR Tracker Report from Futuresource Consulting. "Q1 2018 saw significant growth and rising consumer spend, which is expected to lead to full-year spend of $299 million in 2018 across the four types of LBVR categorised as arcades, multiplayer experiences, VR cinemas, and VR theme parks," said Carl Hibbert, associate director of consumer media and technology at Futuresource Consulting. "Of all four categories, 'VRcades' has seen the fastest take off. The category was estimated at $79 million consumer spend in 2017, accounting for 40 percent of all LBVR revenues." Notable players in the market such as The Void are using well-known franchises to support their rollout of LBVR and support consumers' appeal of this new tech medium. The VRcade category has the highest number of locations, with an estimated 4,000 worldwide, of which those in China account for 75-80 percent. However, the VRcades, particularly those in China, offer low-cost and consequently limited quality experiences, according to the Futuresource Consulting Global Virtual Reality Tracker Report. However, at the other end of the spectrum are high-end, free-roam, and interactive multiplayer 'location-based' VR experiences. By 2022, multiplayer VR experiences will account for 41 percent of Global LBVR consumer spend. 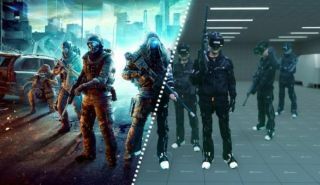 Notable players in the market such as The Void and IMAX are banking on using well-known franchises to support their rollout of LBVR and support consumers' appeal of this new tech medium. But with the cost of popular franchises restrictive for many, start-ups including Zero Latency are building their own content and experience portfolio. Location-based VR is seeing popularity as the entry point for mass consumer adoption of VR, as it serves well to increase consumer awareness and engagement with the technology. The at-home market has seen slower-than-expected uptake, whereas LBVR allows consumers to experience VR without the large investment costs involved in purchasing hardware.